New InfraSauna in Stock: Traditional Steam and Infrared Sauna in One Unit-The Only One on the Market! Good news! 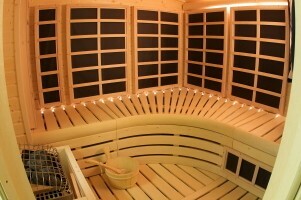 If you’ve been trying to decide between a traditional sauna or a far infrared model for better health, wait no longer. The famous sauna manufacturer Finnleo celebrated its 90th birthday this year by introducing the first and only InfraSauna, which combines the heat and steam of a Finnish sauna and the soft radiant heat of Infrared. Now you can sweat your way to health either way you like in one combination sauna room that includes a traditional Finnleo Finnish sauna heater and Finnleo’s CarbonFlex® far-infrared heating system and we have them at Olympic Hot Tub Company! The new Finnleo InfraSauna builds on the exceptional engineering behind Finnleo’s market-leading traditional Finnish saunas and Finnleo’s line of far-infrared saunas. Until now no manufacturer had been able to overcome potential damage from the wet steam of a traditional sauna to an infrared sauna’s carbon panels. The InfraSauna passed rigorous testing over several years with perfect results. 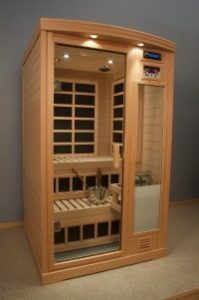 It features a dual digital control system that lets you choose a traditional sauna or infrared-depending upon your mood. The combination InfraSauna system can be incorporated into a wide range of sauna sizes and designs, and is ETL safety listed for incorporation into sauna rooms from 100 to 420 cubic feet. Both systems-sauna and infrared-operate independently of each other. The new InfraSauna is ideal for the individual or couple that likes both far-infrared and traditional sauna. Homeowners have told us that they like to use the infrared as an early morning warm-up before their exercise routine, and enjoy the traditional sauna as a relaxation space in the evening when they can lounge with their spouse. The InfraSauna can be modular and freestanding, or custom built on-site, making it easy to locate the sauna anywhere in the home. Sauna health benefits include reducing colds and flu, better sleep as well as relief from joint pain associated with arthritis and fibromyalgia. Because sauna use releases endorphins-the body’s feel good chemical, regular sauna bathers report that a sauna’s #1 benefit is “stress relief”. The most popular place for a sauna? The master bedroom or bathroom. THE GOOD SWEAT begins with a Finnleo Sauna from Olympic Hot Tub Company!